INDIANAPOLIS (AP) Sung Hyun Park blew one chance to jump back on top of the world Sunday. The South Korean star made sure it didn't happen again. "I'm very honored to be ranked No. 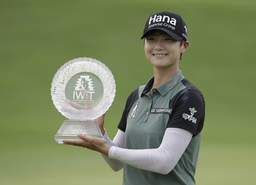 1 and I hope to maintain that ranking for a long time," she said through an interpreter after shooting a 3-under 69 for a four-round total of 23-under 265. "I will try my best." She became the second three-time winner on tour this season and now won five LPGA Tour titles over the past two years - including two majors. After finishing, Park was whisked away to the Indianapolis Motor Speedway's finish line, where she celebrated by kissing the bricks and taking the traditional sip of milk - though she declined to take the milk bath as the event's inaugural winner, Lexi Thompson, did last year. "I didn't expect that tradition, but I was pleased to do it," Park said. But she needed some help to reach the winner's circle. Salas had a two-shot lead after a birdie on the par-4, 13th and seemed perfectly positioned to end her personal victory drought of more than four years - even after Park cut the lead to one with a birdie at No. 14. She dropped into a tie after making bogey at the par-4, 17th and got a reprieve when Park's birdie putt for the lead on No. 18 slid just to the right of the hole. Salas then hit her approach shot from the deep rough on No. 18 within five feet, giving her a chance to win. But after backing away from the putt, she also missed. "I could have freaked out, I could have done a lot of other things, but I stayed patient and I hit the shot I wanted," she said of the chip. "All I could ask for was an opportunity." Both chipped onto the green with makeable birdie putts, but Salas' curved just left of the hole. "I was not nervous at all," Park said. "When the other person missed the putt, I felt relieved that I would make it." Salas' fifth career runner-up finish might have been the most frustrating. After finishing tied for fifth in last year's 54-hole tournament here with three sub-par rounds, she opened this year's event with a course record-tying 62 on Thursday. She then had rounds of 69 and 64 and 69 and stayed atop the leader board through every hole Sunday - until Park's final putt. "I stuck with my game plan and a couple of putts could have dropped," she said. "But you've just got to roll with it." Thailand's Ariya Jutanugarn needed to finish higher than sixth to retain her hold on the No. 1 spot. Jutanugarn tied for seventh after shooting 66 for an 18-under 270. "My goal was to win three times this year," Park said. "I'm trying hard, so maybe I will win again."